OHNYopenstudios in Red Hook Saturday, July 28, 12:00-5:00 p.m. Reception to follow at the Red Hook Winery, 5:00-7:00 p.m. Tickets $30 / $20 for students and seniors. Purchase tickets here. 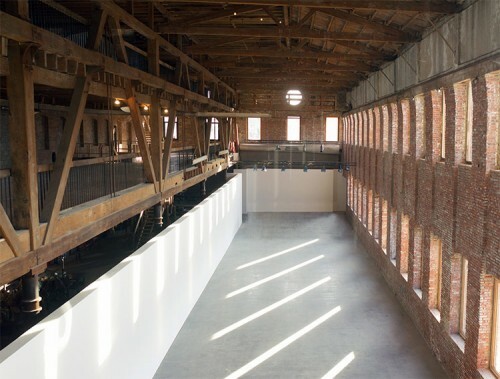 As part of the Open House New York openstudios series, artists' studios in Red Hook will throw open their doors this weekend. In addition, metalworkers, furniture designers, and glassblowers will be thrown into the mix, making it a good fabrication tour as well. The self guided event kicks off Saturday at noon and a wine reception will quench thirst around 5:00 p.m. at the Red Hook Winery. Shifting Skyline. London's famed skyline may be getting an addition, and it's not a new building. 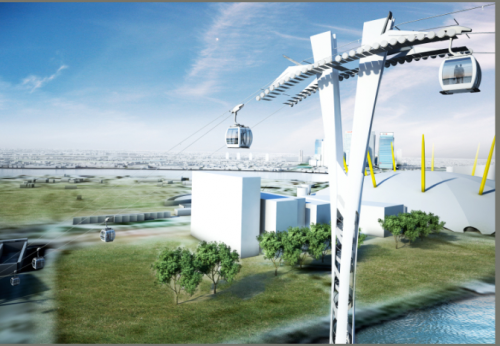 The Architect's Journal tells us that Mayor Boris Johnson recently approved a plan by architects Wilkinson Eyre and Expedition Engineering for a proposed cable car system designed to link two key 2012 Olympic venues, the O2 Stadium and the Excel Exhibition Hall. NYC's Youngest Landmark. The New York Times City Room blog reports that NYC has four new landmarks: the Engineer's Club, the Neighborhood Playhouse, Greyston Gatehouse and the Japan Society, which having been completed in 1971, makes it the youngest of the city's historic landmarked structures. Red Hook North. 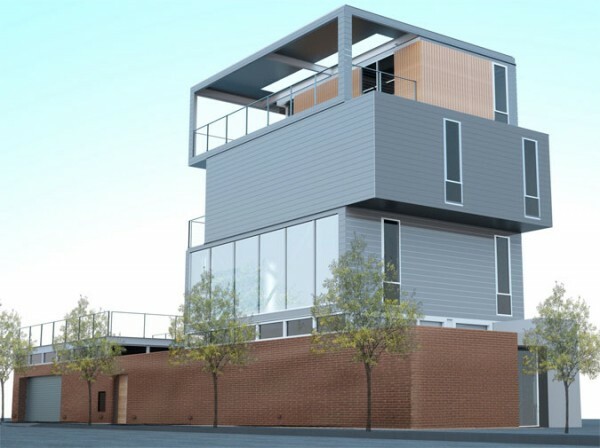 Meanwhile NYT Magazine reports that Red Hook developer Greg O’Connell hopes to do for tiny Mt. Morris, NY what he did for a slice of once-decrepit Brooklyn waterfront. Will the former NYPD detective's progressive form of gentrification and downtown revitalization work in an ailing upstate town? Onion domes in Paris. Inhabitat shares the news that the Russians are coming to Paris, in the form of a new domed church and cultural center. Situated near the Eiffel Tower, this new structure is the result of bi-national collaboration from the architects at Arch-Group and Sade Sa. Hell's Gate. 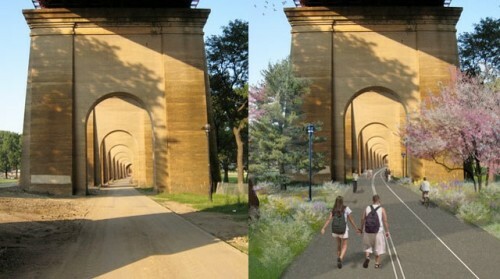 Gothamist reports that the NYC Economic Development Corporation is planning to spruce up a trail beneath the Hell's Gate Bridge railroad trestle on Randall's Island. The pedestrian and bike path will eventually connect to the South Bronx Greenway. Portlandia Greenway. A multi-use path planned since 2004 is finally getting underway in Portland, according to Bike Portland. The South Waterfront Greenway Trail might not feature those great archways from the Hell's Gate Bridge, but it does offer another innovation: separated pedestrian and bike paths. Biking JFK. Golden Gate Park could be much more bikable this spring. StreetsBlog says a bright green dedicated, bi-directional bike lane is planned along San Francisco's John F. Kennedy Drive and will eventually connect western neighborhoods with downtown and park attractions. Have you're say. The Brooklyn Greenway Initiative and the Regional Plan Association are hosting a visioning workshop for a planned greenway in Red Hook, Brooklyn. You can voice your suggestions for the Columbia Street Waterfront Park tomorrow, February 2 at 6:30PM. As of yesterday, my dream of building the first net Zero-Energy work live building in Brooklyn seems to be officially DEAD! ... I was advised that given my particular use, I could make an “M” zoned plot work. What that means is that given the majority of my structure was to be dedicated to commercial use, the living quarters would be an ‘accessory’ to the true function of the building. Therefore we would request the building department grant us permission to live in what would is called a “caretakers apartment”, which would be incidental to it’s primary use. Garrison saw his defeat as part of an ongoing conflict in Red Hook between residential and manufacturing. “It’s been a battleground,” Garrison said because industrial businesses do not want Red Hook to become residential. So Garrison’s lot remains zoned for manufacturing, even though it is actually too small to be used for anything except residential. “Common sense is not prevailing here,” Garrison said. Red Hook blog A View from the Hook shares this sentiment, pointing out that the lot where the project was to be built is next to two residential structures. We'll see how Amato proceeds from here. Three options he's considering - redefine the project as an office building, file for a zoning variance with its requisite costs and delays, or scrap the site and begin anew somewhere else - will surely add time, cost, and frustration to the already ambitious project. Speaking of biking in the city, the Forum for Urban Design held an exhibition and party last night for its first-ever competition. Entitled Reimage Red Hook, the competition sought to make the pioneering, cobblestone neighborhood the premier cycling spot in the city. 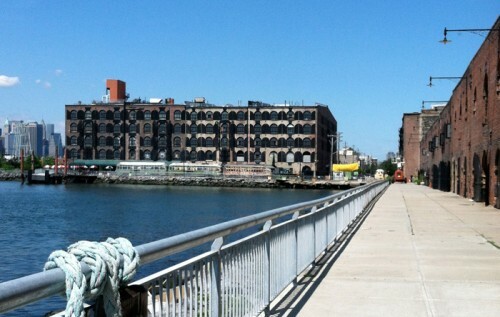 Red Hook is notoriously inaccessible, with only one distant subway station and two bus lines. More than the jobs or cheap furniture it brought, the opening of the new IKEA was most celebrated by locals for the free water taxi and shuttle bus services it brought to the neighborhood. Which is why Lisa Chamberlain, the group's executive director, said it decided to set the competition where it did. "Red Hook has a serious transportation problem," she said. "We didn't want to take a nice neighborhood and make it nicer. We wanted to take a neighborhood where it could actually have a real economic impact." At the exhibition, hosted at the Beard Street Warehouse adjacent Fairway, six finalists were displayed, along with ten honorable mentions. Jonathan Marvel, principal of Rogers Marvel Architects and one of the jurors, made brief remarks about the six finalist, before Chamberlain announced the winners. The four runners-up were Heather Aman Design, Route Peddlers, H3 Hardy Collaborative + EWT, and Jordan Parnass Digital Architecture. She then called the remaining two teams up, HOK Sport and Jonathan Rule, had them say a few words about their projects, before announcing the upset winner, Rule, who also happened to be the only individual entrant. A recent grad from GSD, Rule has actually been working in Spain for morcillo + pallares the past few years, though he is a native son of Brooklyn. His father, a fellow architect who was beaming after the winners were announced, said Jonathan had almost not flown over because of the $1,000 ticket. Thanks to the $10,000 prize, though, the elder Rule joked, "He should have no problem covering that now." Asked by AN if he might be swinging by Disneyland, or at least Euro Disney, with the remains of his prize money, Jonathan paused before admitting to the unsexy truth. "No," he said. "This is going to pay back Harvard." As for his triumphant return to the borough of his youth, Rule acknowledged that is was familiar territory, having written his thesis on the Gowanus Canal. He also said it was gratifying to beat out such big names as HOK Sport and Hugh Hardy. On a more somber note, Rule said his entry was dedicated to Sam Hindy, a childhood friend and son of Brooklyn Brewery founder Stephen Hindy, who died in a cycling accident last year. "It's been on my mind ever since," Rule said. "How can you educate motorists and make the city safe for bicyclists." Here's hoping, through Rule's hard work, that we're one step closer. Be sure to check out the Forum's special competition page for videos, renderings, and explanations of all 16 projects. Chamberlain said the group is still deciding the best way to further these designs, though she also pointed out that representatives of both the city planning and transportation departments were on the jury. "Hopefully they absorbed some of our ideas," she said.